Fisher Towers seen from the road leading to the trailhead. The lower and middle parts of the towers are the Cutler Formation. The lower member of the Moenkopi Formation forms the upper darker part. Fisher Towers, located about 20 miles northeast of Moab in southeastern Utah, is one of the most scenic landscapes along the Colorado River. Administered by the Bureau of Land Management, Fisher Towers Recreation Site is a popular destination for hikers and rock climbers. A moderate 2.2-mile (one way) hiking trail takes you along the base of the towers and spires to a scenic overlook of Professor Valley and the Colorado River. Fisher Towers contains layers of sedimentary rock in various shades of red-brown, red-purple, and maroon. The colors are a result of varying amounts of hematite (an iron oxide). 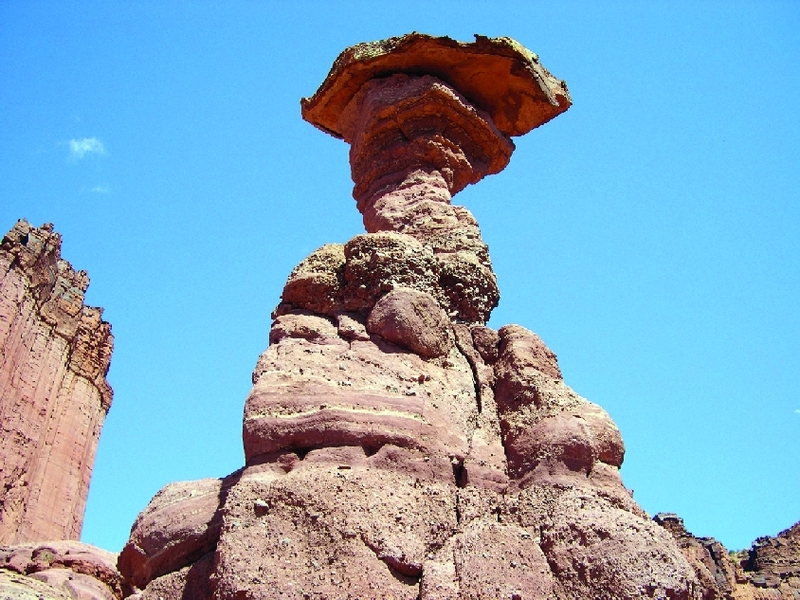 The upper, darker part of Fisher Towers consists of the lower sandstone member of the Triassic Moenkopi Formation (approximately 245 million years old). The middle and lower parts of the towers are sandstone, mudstone, and conglomerate of the Permian Cutler Formation (approximately 290 million years old). 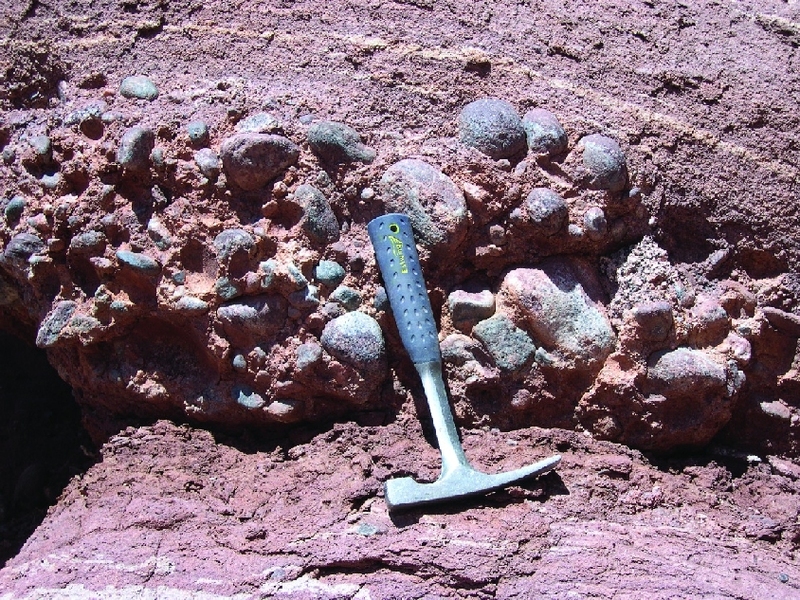 The conglomerate contains sub-rounded to rounded cobbles and pebbles of quartz, feldspar, mica, granite, schist, and quartzite that were eroded from nearby Precambrian (over 1 billion years old) metamorphic and igneous rocks. These rocks originated from the Uncompahgre highland, a mountainous region that formed at the beginning of the Pennsylvanian period (approximately 320 million years) in western Colorado and eastern Utah. Rivers and streams flowing south from the Uncompahgre highland eroded, transported, and then deposited rock and sediment in channels and flood plains. By the end of the Permian period (250 million years ago), the Uncompahgre highland no longer existed; it had been reduced to low hills and plains. The Colorado Plateau region was uplifted starting approximately 80 to 50 million years ago, and over the past several million years many of the existing erosional features of the Colorado Plateau were created, including canyons, mesas, buttes, arches, bridges, hoodoos, spires, pedestals, and towers. 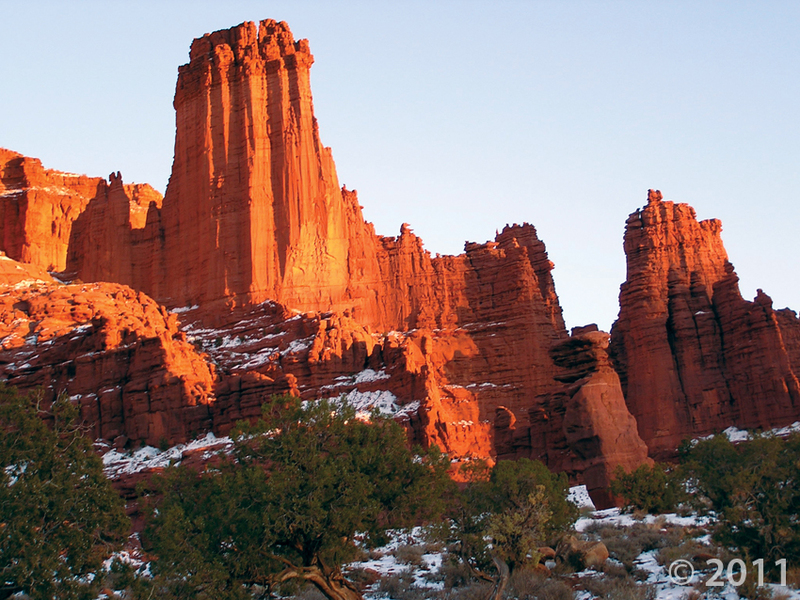 At Fisher Towers, erosion continues to sculpt the towers, spires, and pedestals. One area, approximately one mile from the start of the trailhead, contains several rock pedestals capped by large sandstone slabs of the Moenkopi Formation. These rock slabs fell from the cliffs high above. The sandstone, more resistant to erosion than the softer underlying layers of the Cutler Formation, protects and preserves the soft rock underneath, creating rock pedestals. 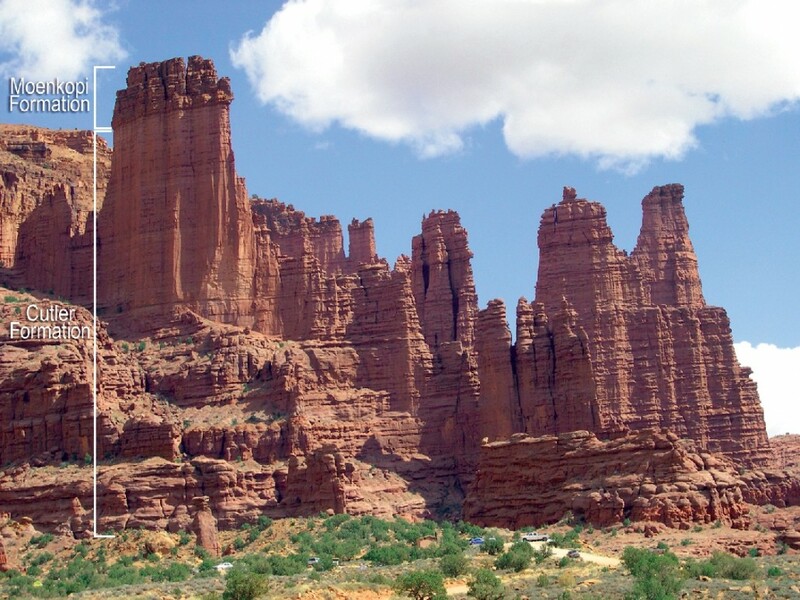 In a similar manner, the Moenkopi Formation has provided a resistant cap for some of Fisher Towers, allowing erosion to carve the awe inspiring spires and towers that we see today. From Moab, travel 2 miles northwest along U.S. 191 to the turnoff for Utah State Highway 128. Turn right (northeast) and travel approximately 21 miles to the turnoff for Fisher Towers Recreation Site (just past milepost 21). Turn right (east) and proceed 2.2 miles to the trailhead.